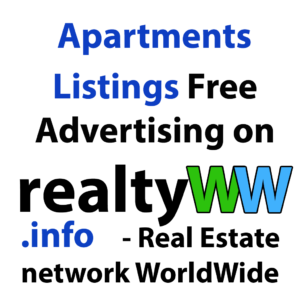 How to advertise using the apartments listings? The vast majority of apartments listings are served today to the Internet sites. Therefore, all information is available in the electronic format. Some people use an old proven method putting up apartments listings in the area where the apartment is located. A significant disadvantage of this method is that the paper will not hang a more than a single day, so we can not expect continued interest from potential buyers. Real Estate Agencies can completely eliminate the landlord from hassle. Agent himself will negotiate with the buyer, show rooms, check out the necessary documents. But it is necessary to pay for the fair payment for these services. This option is suitable for the owner of a good apartment with a new renovation, which expects to be paid above the market average. There are no special forms for apartments listings, but the owners are trying to follow certain patterns, indicating the minimum information required. How to write apartments listings for the sale by the owner? You should start with the words “Apartment For Sale” and with a description of real estate characteristics: number of rooms, size of the apartment, whether separate toilet, a balcony if available. Specify the address and a brief description of nearest useful objects: large shops, parks, subway stations and so on. As a rule, the owners keep silent about those objects, which can reduce the cost of apartment: enterprises close to home, railway tracks. Describe in detail the advantages of your apartment: the quality of repair, some furniture, a standard set of household appliances (washing machine, microwave, TV and so on), whether wi-fi is available. You can make more creative apartments listings for the sale. Apartments listings should be objective. Do not attribute the housing some non-existing properties. The future owner will take place from room to room by himself, watching furniture and sanitary ware. Cheating in the apartments listings will only lead to the fact that a prospective buyer will begin to bargain down the price or will just go away. Be sure to specify the necessary contacts and the desired communication method. Buyers and representatives of real estate agencies will call often, sometimes even at night. And the calls will continue even after apartments listings will be removed from the real estate sites. It makes no sense to ask real estate agents not to call the above number. Agents will still communicate with the owner of the property and will offer their services, assuring that the appropriate client is already found. Try to take some pictures of your apartment: room, kitchen, bathroom, hallway. The function of the camera now can perform even a mobile phone. Therefore, almost all apartments listings on the Internet are exhibited with photographs of property. The lack of graphical information will alert the buyer to consider this publication as last one. Where is the best place to post the apartments listings for sale for free? Today, the apartments listings for sale are almost always placed on the Internet. You do not need to go anywhere, to conclude a contract or to pay a fee. Making apartments listings will take less than five minutes. In addition, you can put your apartments listings on more than one website. The owner of the apartment should be prepared for the fact that unscrupulous realtors will “take” an apartment on behalf of their agency, using data and photos from the ad. In this case, simply complain site administration about such publication. On what websites it is possible to post apartments listings with fee? Paid apartments listings are served only if the owner wants to highlight his message or to raise it to the first place in the search results. The so-called “premium ads” are made for this purpose. This option is suitable for those sellers who want to find quickly a buyer of their property. Newspaper listings are gradually recede into the past. Following the publication of data about apartment, the owner must be patient. He will receive numerous calls from realtors, long trades regarding value and inadequate requirements of future tenants. Sale of property is not only income, but also work. This entry was posted in Real Estate Advertising and tagged Advertise Apartments, Advertise Apartments for Free, Advertising Apartments, Advertising For Apartments, Apartment Listings, Apartments Advertisement, Apartments Advertising, Apartments Listings, Apartments Listings for Rent, Free Ads for Apartments, Free Advertising Apartments, Free Advertising for Apartments, Free Apartment Advertising, Free Apartment Advertising Websites, Free Apartment Listings, Free Apartments Listings, Free Real Estate Listings, International Real Estate Listings, International Real Estate Listings Free, Listings Apartments, Listings Real Estate, Online Real Estate Listings, Post Real Estate Listings, Property Listings, Real Estate Agency Listings, Real Estate Agent Listings, Real Estate Company Listings, real estate listings, Real Estate Listings for Rent, Real Estate Listings for Sale, Real Estate Listings Free, Real Estate Listings Online, Real Estate Listings Website, realty listings, Where to Advertise Apartments, Where to Post Real Estate Listings for Free. Bookmark the permalink.